Today you’ll be honing your skills and talents to perfection, so that they can be put to practical use. And not just any skills at that because Mars moves into Aquarius today the skills you may be calling on could be a bit out of the ordinary for you but you will be hit with the thought to use them just the same. If you try doing so you may learn more than you imagined. Although the Magician is full of lofty ideas and goals, they don’t amount to much if they can’t be brought down to earth and made manifest. This is your goal today: to take all you think and know and make it accessible to others in a useful way. In this deck, Hermes — patron god of travelers, thieves, messengers and magicians — is depicted as the Magician, pointing upwards toward the heavens and downwards toward the earth. 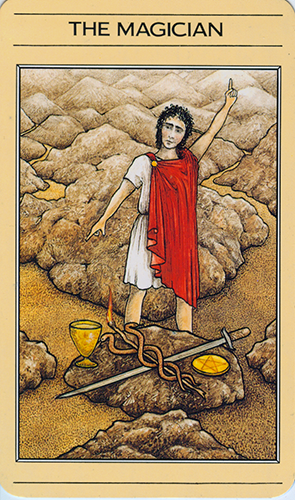 The four elements (fire, earth, air and water) are at his feet, symbolizing the four suits of the tarot. It’s clear that he has all he needs right there at his disposal, if only he puts them to use. Mars moving into Aquarius today gives you a spark for the creative where ideas may just come to you at the drop of a hat. Perhaps carrying a small notebook around would be a good idea so you can write them down. Today’s card — The Magician — comes from the Mythic Tarot by Juliet Sharman-Burke and Liz Greene, illustrated by Tricia Newell, distributed by U.S. Games. This deck can also be downloaded as an app for IPhone, IPad and Android devices through the Fool’s Dog website.